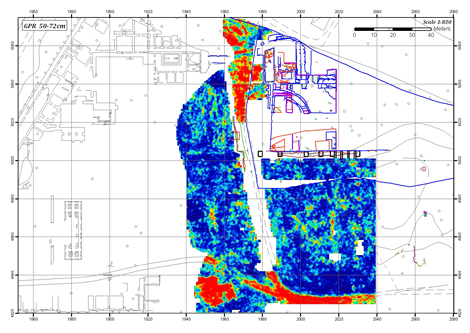 GPR is used by archaeologists to map buried deposits by recording the speed with which radar wave reflections are returned from a small mobile device moved across sites. 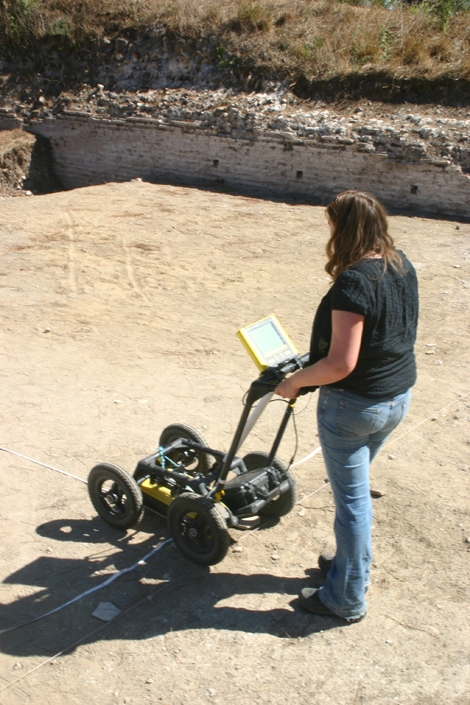 At Portus, the project team uses a range of GPR frequencies. Low frequency systems enable us to see many metres beneath the ground, but at relatively low resolution; whilst high frequency devices provide much higher resolution images but of only the top few metres of soil. The resulting data are similar to a CAT scan of the ground in that it is possible to pick out volumes with greater density, to cut virtual vertical and horizontal slices through the earth, and to otherwise identify particular archaeological or geological features of interest. GPR has been invaluable at Portus in the interpretation of the complicated stratigraphy of the Palazzo Imperiale and other structures.